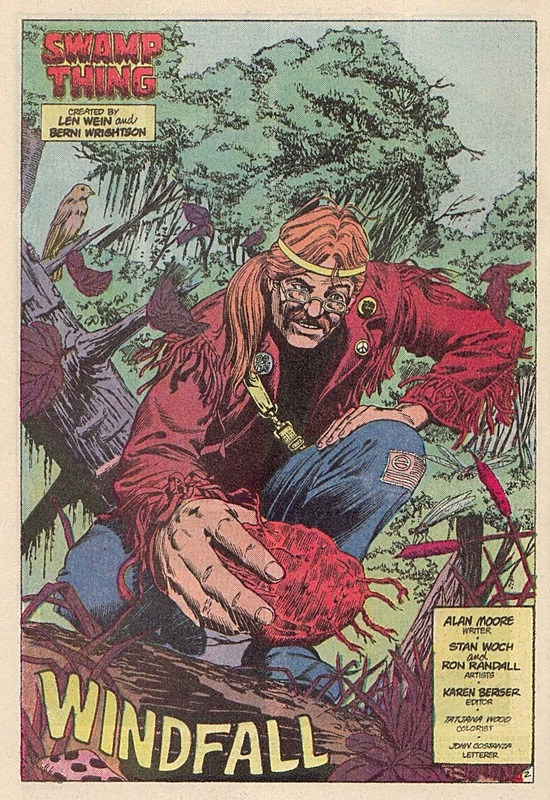 This is the fifteenth of twenty-two parts of Chapter Eight of The Last War in Albion, focusing on Alan Moore's run on Swamp Thing. An omnibus of all twenty-two parts can be purchased at Smashwords. If you purchased serialization via the Kickstarter, check your Kickstarter messages for a free download code. Previously in The Last War in Albion: In amidst the American Gothic arc were a couple of one-shots, including one entitled "Windfall." 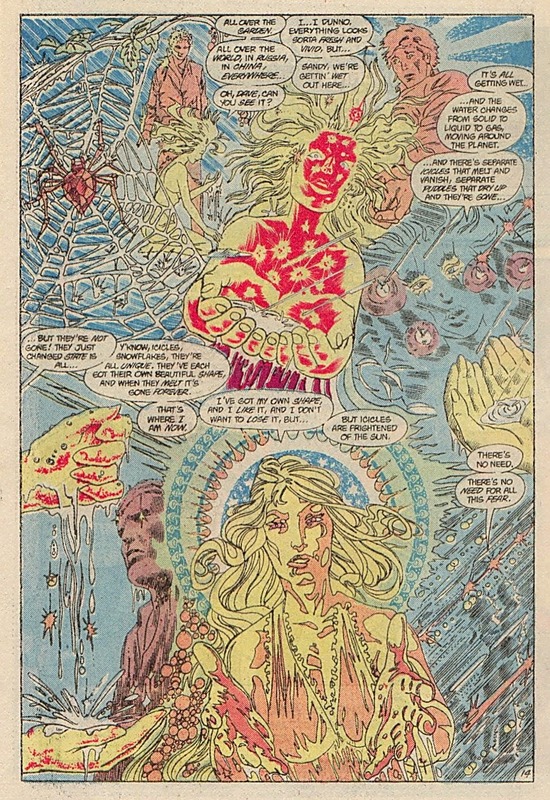 In many ways, “Windfall” is a sequel to “Rite of Spring.” Like “Rite of Spring,” it engages explicitly with psychedelia, telling the story of two people who come into possession of one of the tubers that grow on Swamp Thing’s back. What is perhaps most notable about “Windfall,” however, is that the story’s protagonist is a drug dealer. 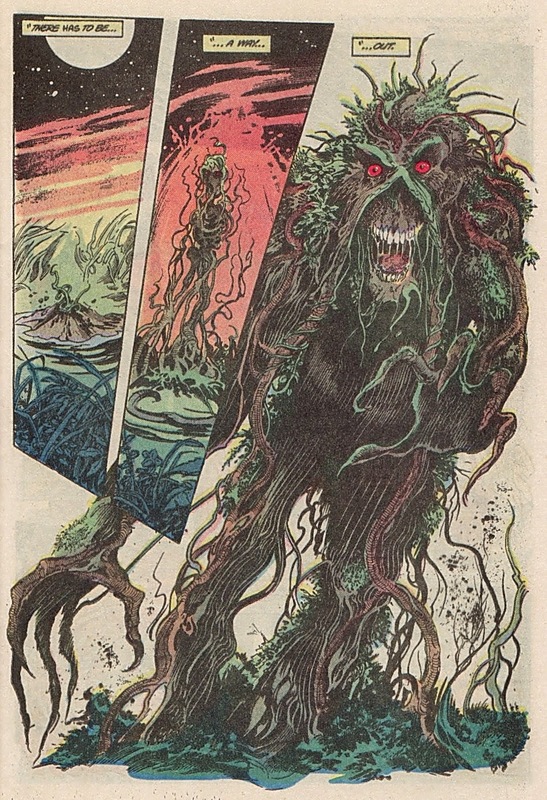 Swamp Thing himself only appears in the first four panels of the strip, which show one of the tubers dropping off his back. At that point it’s picked up by an aging hippie named Chester (complete with Grateful Dead shirt) who may or may not be physically modeled off of Bryan Talbot’s Chester P. Hackenbush. 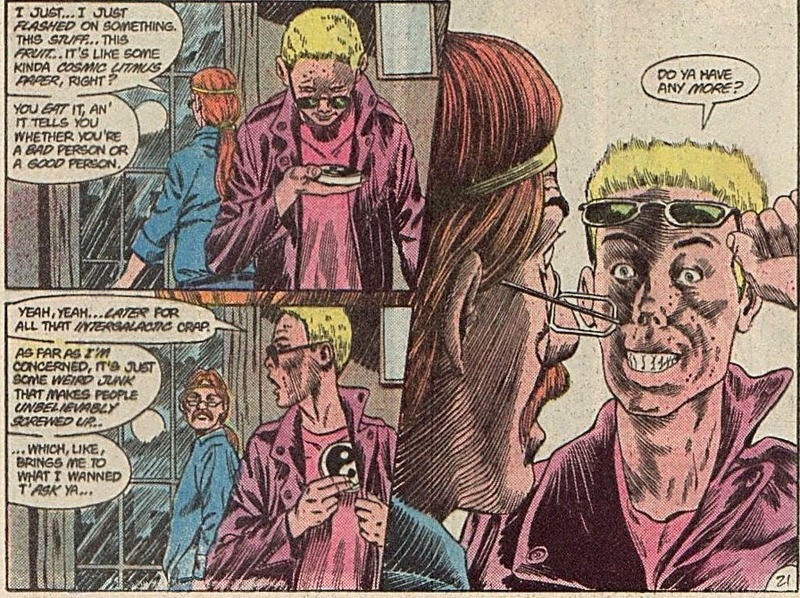 Although at the time of the story Chester is, as he puts it, “doin’ ten days brown rice, tryin t’clean my system out, y’know,” he’s clearly a man with an extensive interest in ethnobotanicals and psychedelics, such that two separate people come to him looking for drugs. The first is a man called Dave, whose wife Sandy is dying of cancer with only a day or two left to live, and is in excruciating pain. Although Chester is not sure what (if anything) the tuber does yet, besides suspecting that it might be somehow related to datura (which, in some forms is, notably, a rhizome), he offers Dave a piece. Immediately after Dave leaves Chester gets his second visitor: a boorish guy named Milo who declares bluntly that “I feel like getting screwed up tonight” before simply taking the biggest piece of the tuber without paying for it. Milo, meanwhile, does not have quite so good a time of it, having a hallucination in which he relives the origin story of Swamp Thing, feeling himself burning as he’s thrown out of a bar, landing in a puddle,in which, as he gets up, he sees his own reflection twisted into Swamp Thing’s visage. At this point he begins hallucinating a variety of monsters from the past history of Swamp Thing (reaching back all the way to a clockwork monster from the Wein/Wrightson Swamp Thing #6) as he rants about how “this is what the world’s really like, isn’t it? I can see it now. We’re all monsters” and how “everything just dies and rots, gets fulla bugs, mindless bugs, eatin’ each other… it’s horror. It’s all horror” before ultimately being hit by a truck he imagines to be driven by Anton Arcane. His experience echoes back to the “American Gothic” arc in which “Windfall” is embedded, as he envisions “a city, a continent, a whole planet full of torture, madness, death,” thus, in contrast, reestablishing the twin themes and principles underlying Moore’s overall tale. The story ends with both Dave and an unnamed friend of Milo’s coming back to Chester to relate what happened - Dave in order to tell him that he “gave my wife’s last moments some meaning” and that he “ought to feel good about that,” Milo’s friend to complain that “you gave Milo that stuff, you as good as killed him” before asking if Chester has any more. Chester, musing on it, decides that “this fruit… it’s like some kinda cosmic litmus paper, right? You eat it, an’ it tells you whether you’re a bad person or a good person,” before being left alone with the last slice, and the decision whether to try it. “I think I’m a good person,” he muses as Country Joe and the Fish’s “Bass Strings” plays. “I mean,that’s what I try to be… I don’t abuse the planet, or other people, and I’m never violent or anything… but, like, I still eat meat, and I sometimes think some pretty bad things… I said some stuff to Suzanne before she left, and I wish I hadn’t said it. I was so bitter. But hell,” he concludes, “there’s worse people than me.” But ultimately, after considering the last piece, Chester puts it back on the plate and opts not to face whatever cosmic revelation it might offer him. Chester’s status as an occasional drug dealer with an interest in psychedelics, to say nothing of his shaggy hippy demeanor, evokes Moore’s own background significantly. 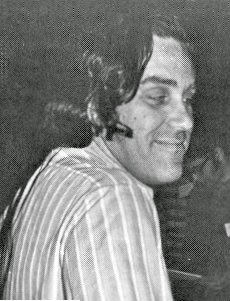 In many ways, “Windfall” seems to exist to make the point that Moore made in a 2009 interview, where he criticized recreational drug use, noting that psychedelic drugs like psilocybin “were sacred at one point, which meant that you weren’t supposed to eat them unless you were properly initiated in a tradition, you’d done your Eleusinian Mysteries or whatever.” More bluntly, as he put it, “in our current society, the only context we have to take drugs in is a leisure context, which a lot of time is disastrous.” Certainly there’s a tacit moral judgment in “Windfall” between the legitimate use of psychedelics and the thrill-seeking junkies that Chester (and, clearly, Moore) have no regard for. But it’s important to note that Sandy’s trip - the one that is presented as the good trip - is very much about rejecting an easy dualism between life and death. Given this, treating the two trips as a straightforward moral parable about the proper use of drugs is misleading. What Milo hallucinates may be horrific and ultimately fatal, but it’s also in line with the frequent themes of the comic. Indeed, Milo’s trip is not that different from the experience of the serial killer in the next story - both characters encounter (symbolically or otherwise) Swamp Thing, triggering an ultimately fatal existential crisis as they confront his monstrosity and thus their own. The idea of a fundamentally sick world is at the heart of the tour Constantine forces Swamp Thing to go on to see “the blackness within this continent.” The idea of the monstrous is as fundamental to Moore’s story as the idea of nature’s balance, and while Milo’s methodology in drug use may be criticized, it would be wrong to suggest that his trip is somehow untrue or wrong. In other words, while there clearly is a cautionary element to “Windfall,” there’s also, as one would expect from Moore, a clear embrace of the psychedelic in the fullest sense, good trips and bad. Indeed, given the focus on balance within the good trip segments, this seems self-evident. In this regard, even though “Windfall” is a break from the larger “American Gothic” storyline that it’s placed within, it’s still pointing towards the same overall conclusion - a five issue arc about the apocalypse. This is, it is worth stressing, something that was set up from the very start of the arc. 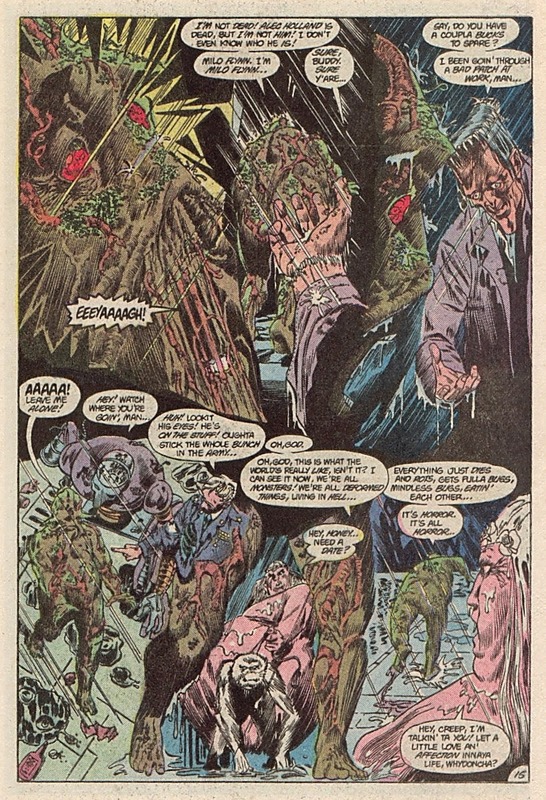 In Constantine’s first appearance, he comes to visit Swamp Thing after getting a variety of reports suggesting that some sort of cataclysmic event is going to take place in a year’s time. The details are sketchy, but it apparently involves a South American cult of some sort that’s going to use “all the old frighteners” to “increase the belief levels” of the world and unleash some greater nemesis. Constantine briefly lists said frighteners, and the list corresponds pretty much exactly to the stories that then unfold: “werewolves, vampires, haunted houses,” and “dreams.” And sure enough, in May of 1986, exactly twelve issues on past Constantine’s first appearance, comes a story in which a South American cult unleashes an awful supernatural terror upon the universe. This five issue apocalypse arc forms the second half of the “American Gothic” storyline, although there’s a clear transition between them - the first portion, doing classic horror monsters in America, diagnoses and lists the psychic sins of America, whereas the apocalypse arc submits those sins for eschatological judgment. The first part of this story, however, connects to a far larger part of DC Comics history, namely Marv Wolfman and Geroge Pérez’s epic Crisis on Infinite Earths. This story, published as a twelve-issue limited series, was a watershed moment in the history of comics. It came about due to the confluence of two seemingly unrelated things: the fact that DC Comics took place in a multiverse consisting of infinitely many parallel universes, and the fact that over the course of the 1970s and 80s American comic book retailing had steadily transitioned from being dominated by newsstands and other magazine vendors to being dominated by shops focusing exclusively on comic books. As far as my own experiences with psychedelics go, I found it wasn't so much a case of having 'good trips' or 'bad trips'; rather, since the trip is so long (around ten to twelve hours with acid) it's more a series of peaks and troughs - a 'good' moment could transform into a 'bad' moment in seconds. It was part of the fun, to be honest! I'm now really looking forward to what you have to say about Seuling and direct distribution. Not that I haven't been enjoying everything else, but I can't help feeling like direct distribution was a sort of "deal with the devil" for the comic book industry, shifting the risk to a third party at the expense of the public visibility that comics had enjoyed for decades, and I really want to see if you'll get into that at all. Not a ton on this pass, but it's something I intend to come back to. "reflecting on the experience, Moore rejected the idea that what he’d experienced was a past life"
Having had similar experiences, I pretty much also never took up the idea of 'other lives', which suggests that we move through a linear set of experiences - but for me I'd go for Moore's perspective that there is some kind of unified thing going on. Having had my share of experiences, both with substances and without, I can certainly agree that those that were more hair-raising gave me some gifts to learn about myself and the world around me. 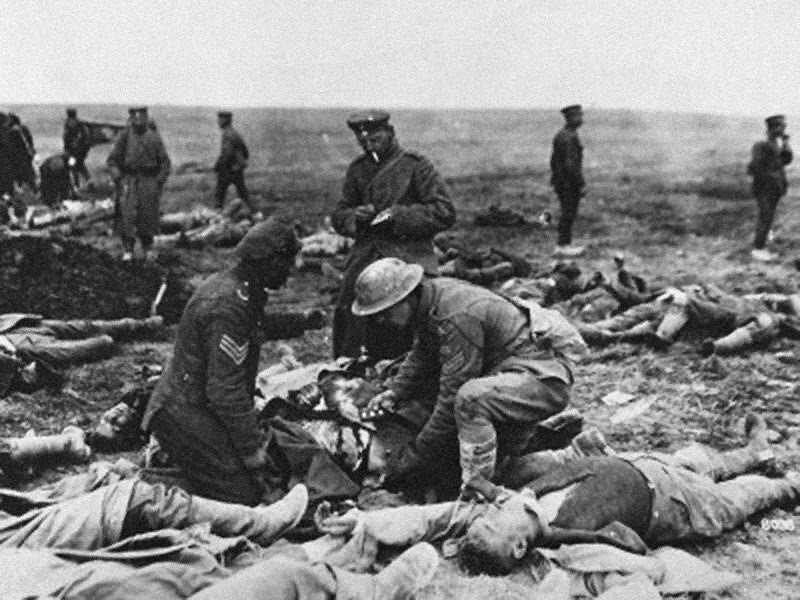 What a beautiful story and thanks for a great essay.